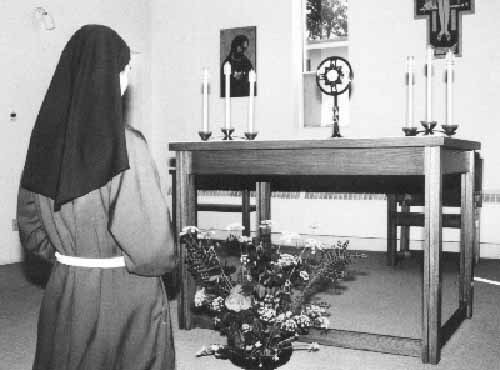 The center and high point of our life is the daily Eucharist, and we give the Lord the praise that is due (Ps 146:1) seven times a day through the Liturgy of the Hours, the Prayer of the Church, including the midnight Office of Readings. We also have three hours of Exposition of the Blessed Sacrament and spend at least one and a half hours per day in private prayer with Him. Praying the rosary and the Franciscan Crown and following the Way of the Cross are important parts of our daily life. Our prayer is our mission in the Church and in the world. It touches every person and lifts up the whole earth into the merciful heart of God. Through it we feel very much a part of the lives of all people, as we are united with their suffering and joys. The many requests for prayer and the gratitude expressed by those who have received graces through our prayer keep us in touch with the personal needs and sufferings of our world. We are also concerned about the many political, national and international crises that call for prayer and sacrifice. One of the greatest joys of our way of life is to know that so many persons are praying with us and for us and that our lives of prayer are an encouragement to others to seek that deeper union with Jesus to which we are all invited through the sacrament of Baptism.